Each year, Ecumenical Advocacy Days (EAD), a coalition of more than 50 national and regional Christian social-justice organizations and congregations, draws 1,000-plus people to its National Gathering and Lobby Day in the Greater Washington, D.C. area. 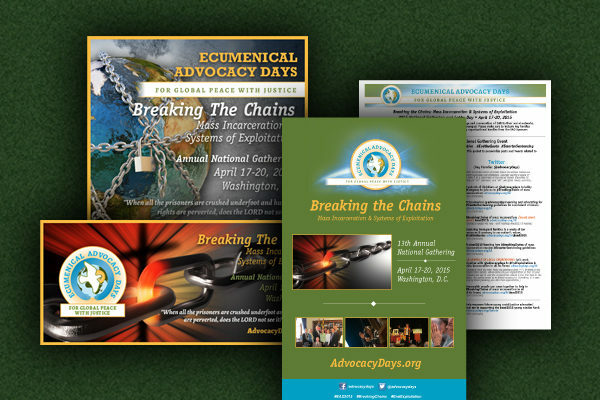 For its 13th event, held in April 2015, EAD chose the theme of “Breaking the Chains,” an encapsulation of its effort to address significant issues in the U.S. and global criminal justice and immigration detention systems. The National Gathering weekend consisted of keynote plenaries, issues and advocacy skills workshops, worship, networking, and preparation for a lobby day on Capitol Hill around specific policy recommendations. For a third straight year, Perisphere was EAD’s strategic partner over the course of an entire event cycle – from initial theme conception, brand development and collateral design, on to strategic website content updates announcing featured speakers and activities, to immediate event collateral preparation and planning, and, finally, to high-level event direction and on-site participation. Initial deliverables included a sponsor promotional kit, which featured Perisphere-curated main and alternate theme images, as well as a sample social media guide intended to increase sponsor engagement around event registration and other key aspects of the National Gathering promotional rollout. The theme images were integrated with photography and brand materials we had previously produced in order to create new print materials, most notably this general brochure and theme insert for 2015. Perisphere also designed and produced the 2015 National Gathering folder and a comprehensive social media reference kit. The latter included sample Facebook posts and Tweets for use and adaptation by advocates at the gathering and during the lobby day, as well as sponsor and speaker reference sheets. We also worked closely with EAD to produce a branded PowerPoint template for use in visual projection at the event.